The Allen-Bradley Clock Tower is a four-sided clock that sits on top of the ALLEN-BRADLEY Building (now Rockwell Automation) on the South Side of Milwaukee. Local ARCHITECT Fitzhugh Scott designed the tower. The clockworks were built by Allen-Bradley, which specialized in electrical controls, while the clock faces were created by Super Sky Products in MEQUON. 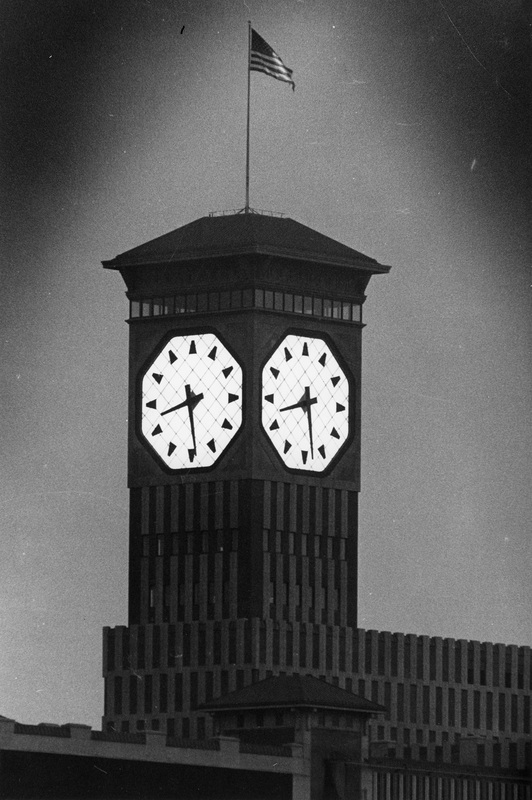 From 1962 until 2010, when it was surpassed by one in Saudi Arabia, the Allen-Bradley Clock Tower was the largest four-sided clock in the world. When it was unveiled on October 31, 1962, the clock tower replaced a lower clock tower that rose above a different Allen-Bradley building. The original clock, standing 160 feet above street level, was removed after the new tower was operational. The current tower is 280 feet above street level. Each of the four clock faces is 40 feet, 3 inches in diameter; they are powered independently. It takes about 10 minutes to reset the time by one hour. The clock tower is sometimes referred to as the “Polish Moon,” as its illuminated faces dominate the skyline of the South Side, which once had a large POLISH population. Harry Bradley, one of the founders of Allen-Bradley, intended the tower to become the “village clock” for the neighborhood. It also became a navigational landmark, as the faces can be seen miles out into LAKE MICHIGAN on a clear night. ^ “Lighted 40 Foot Clock on Tower a Landmark for Lake Skippers,” Milwaukee Journal, June 8, 1963, accessed March 16, 2015, https://news.google.com/newspapers?nid=1499&dat=19630608&id=yR0aAAAAIBAJ&sjid=HicEAAAAIBAJ&pg=4164,3924544&hl=en. ^ “Allen-Bradley Has Largest Four-Sided Clock in World,” Milwaukee Sentinel, November 1, 1962, accessed March 16, 2015, http://news.google.com/newspapers?nid=1368&dat=19621101&id=eHFRAAAAIBAJ&sjid=xBAEAAAAIBAJ&pg=4632,148833; Molly Snyder, “Greetings from the Top of the Allen-Bradley Clock Tower,” OnMilwaukee.com, February 13, 2012, accessed March 16, 2015. ^ “Allen-Bradley Has Largest Four-Sided Clock in World,” Milwaukee Sentinel, November 1, 1962, accessed March 16, 2015, http://news.google.com/newspapers?nid=1368&dat=19621101&id=eHFRAAAAIBAJ&sjid=xBAEAAAAIBAJ&pg=4632,148833. ^ David Kriesel, “How Do They Operate That Huge Clock at Allen-Bradley?” Milwaukee Journal, June 3, 1982, accessed March 16, 2015, https://news.google.com/newspapers?nid=1499&dat=19820603&id=umIaAAAAIBAJ&sjid=CCoEAAAAIBAJ&pg=1261,2231070&hl=en. ^ Molly Snyder, “Greetings from the Top of the Allen-Bradley Clock Tower,” OnMilwaukee.com, February 13, 2012, accessed March 16, 2015. ^ John Gurda, The Bradley Legacy: Lynde and Harry Bradley, Their Company, and Their Foundations, (Milwaukee: Lynde and Harry Bradley Foundation, 1992), 129.